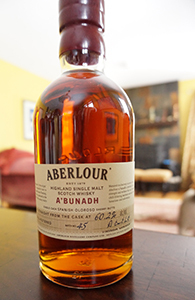 Yesterday I had a report on my recent visit to Aberlour. 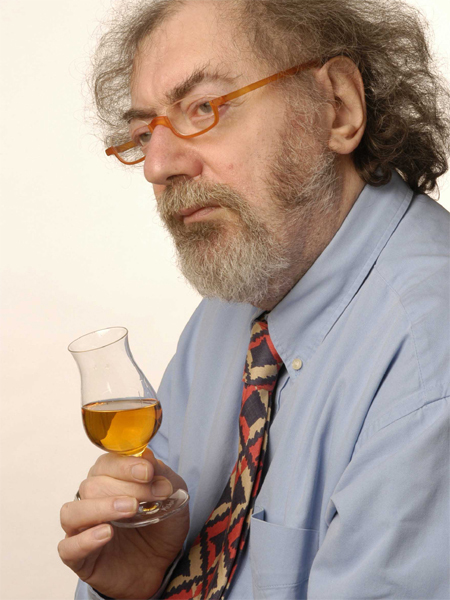 Today I have a review of their 10 yo whisky. I believe this is their current entry-level malt. It’s been a long time since I last tasted this whisky*, which comprises spirit married in bourbon and sherry casks and is generally fairly priced. Well the 10 yo was part of the tasting at the end of the tour as well, but I didn’t taste it then, as I was driving after. The sample I took away didn’t make much of an impression but it was a very small pour—much too small for a review. But as luck would have it the friend we stayed with in London for a few days after our Scotland trip had a bottle open and so I tried it a couple of times and wrote my notes up. Here they are. I was inspired by last week’s Blackadder Aberlour 17, 1990 review to see if I had any other samples lying around of bourbon cask Aberlour and found this 20 yo bottled by Signatory that I received in a swap a few years ago. 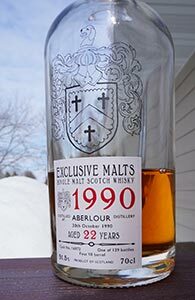 This will be my third review of a bourbon cask Aberlour from the 1990 vintage (I know it’s a small n but I wonder if there were a bunch of casks from that year that made it to the warehouses of independents for whatever reason). If it’s as good as the other two, I will be very happy. Let’s see if it is. 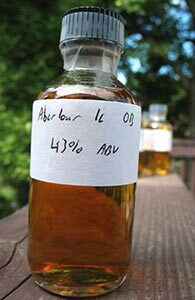 Aberlour are known for their sherried malt, whether it is the young, cask strength A’bunadh, beloved of so many geeks, or the regular 12 and 16 yos. They do mature a fair bit in bourbon casks, obviously–obvious because their non-A’bunadh releases tend to be double matured or vatted from sherry and bourbon casks–but very little of this, if any, sees the light of day as official distillery releases. As always, we have the indies to turn to for the variety the distilleries are reluctant to give us in order to maintain their “distillery character”, and so this 22 yo from Exclusive Malts which is the oldest Aberlour I think I’ve had to date.